DALLAS (June 14, 2017) — Donations through in-store Miracle Balloon Fundraising Campaigns at Stripes and APlus stores helped raise more than $1.6 million dollars for Children’s Miracle Network Hospitals (CMN Hospitals) around the country. 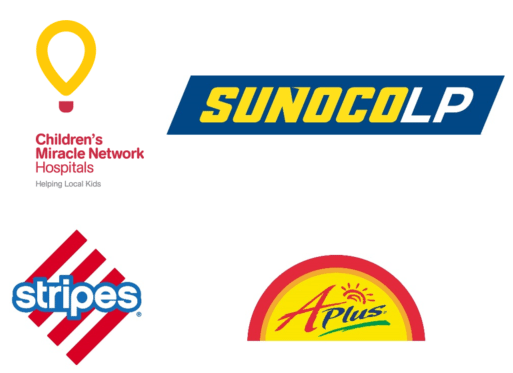 Since 2000, Stripes and APlus, owned and operated by Sunoco LP, have partnered with CMN Hospitals to raise more than $12 million for sick and injured kids. Like all in-store CMN Hospitals fundraisers, 100 percent of funds raised from Sunoco LP campaigns will benefit the community in which they were raised. Those contributions help make miracles happen by funding vital medical care, equipment and therapy programs that save and improve the lives of more than 10 million sick and injured children each year. (NYSE: SUN) is a master limited partnership that operates 1,355 convenience stores and retail fuel sites and distributes motor fuel to 7,825 convenience stores, independent dealers, commercial customers and distributors located in 30 states. SUN’s general partner is a wholly owned subsidiary of Energy Transfer Equity, L.P. (NYSE: ETE).